Andy Warhol was an American artist who was the leading figure of the Pop Art movement. Such was his impact that he is called the Pope of Pop Art. The subject of his works varied from iconic American objects to celebrities to fictional characters to traditional subjects like flowers. His paintings revolutionized the perception of art. Here are 10 of the most famous pop art paintings by the pre-eminent pop artist. In the 1960s Andy Warhol was associated with the band The Velvet Underground and he became their manager in 1965. 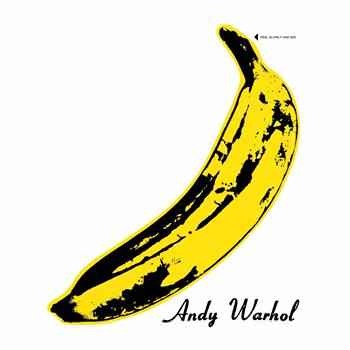 This print of banana featured on the cover of the debut album of the band, titled The Velvet Underground & Nico. The album was called the “most prophetic rock album ever made” and ranked 13th greatest album of all time by the Rolling Stone magazine; and Warhol’s Banana became one of the most recognizable pieces of pop artwork. Warhol created a Myths-series which contained a series of silkscreened portraits of ten fictional characters taken from popular culture. All the portraits were inlaid with diamond dust which made them shine with soft, wavering light. 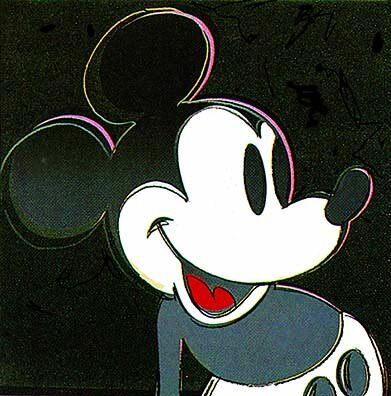 Disney’s Mickey Mouse was one of the characters he picked and its prints became hugely popular. In 1963, the last two executions by electric chair in New York State took place. The same year Andy Warhol obtained a photograph of the empty execution chamber. 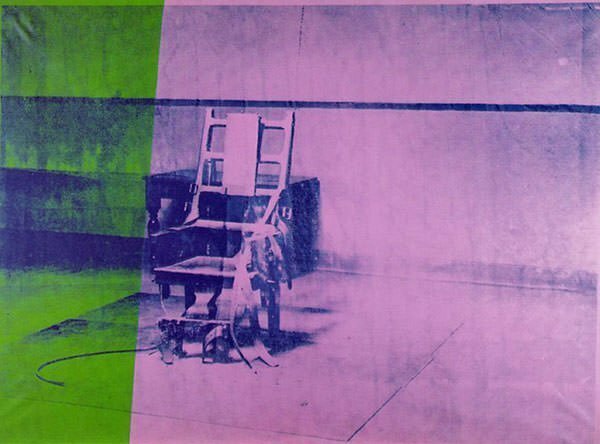 He used it to create a series of paintings depicting the electric chair as a metaphor of death and thereby commenting on the controversy surrounding the death penalty in the 1960s. Big Electric Chair is the most famous painting of the series. 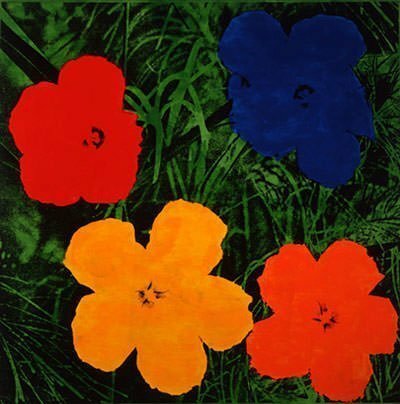 This is one of the seven monumental-scale paintings from Andy Warhol’s famous Flowers series. The source image for the series was photographs published in the 1964 issue of Modern Photography taken by the nature photographer Patricia Caulfield. At a time when Warhol was concentrating on consumerism, celebrity, death and disasters, the series was a departure as it depicted a more abstract and philosophical subject. The paintings were immediately sold out when they were put on show. 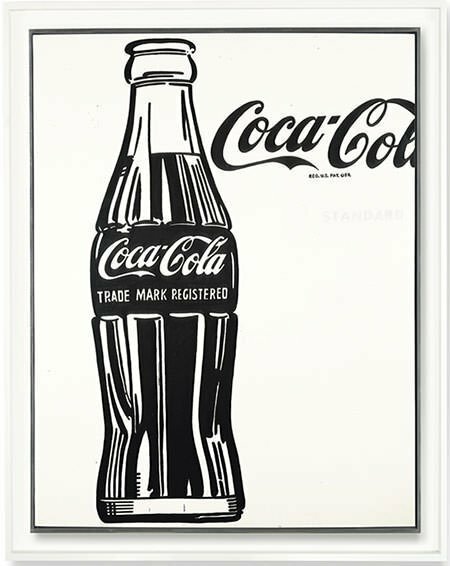 A symbol of modern mass consumerism, the Coca Cola bottle is an iconic American object which caught the fancy of Warhol. In fact one of his most famous quotes revolves around it. Warhol created several works on the Coke bottle. Coca Cola (3) is a hand painted work unlike his later silkscreens. The painting was sold for $57.2 million making it one of Warhol’s most expensive paintings ever sold. Warhol began painting portraits of Mao in 1972, the year U.S. President Richard Nixon made his first visit to China. He created hundreds of images of Mao using a photograph from Mao’s famous Little Red Book. This huge painting is about 15 feet tall and is the most well-known Mao portrait by Warhol. 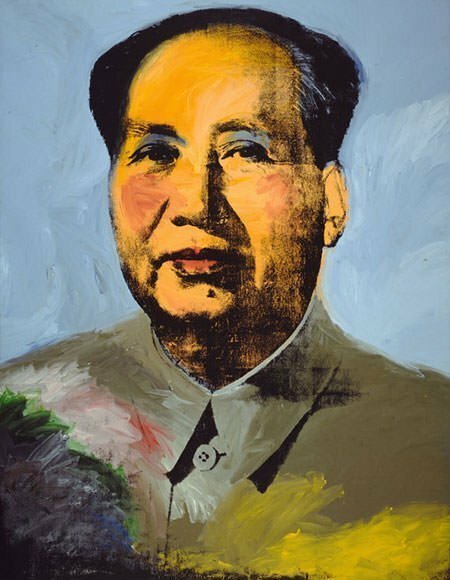 Warhol has used strong, colorful brushstrokes applying garish colors like makeup on Mao’s face. 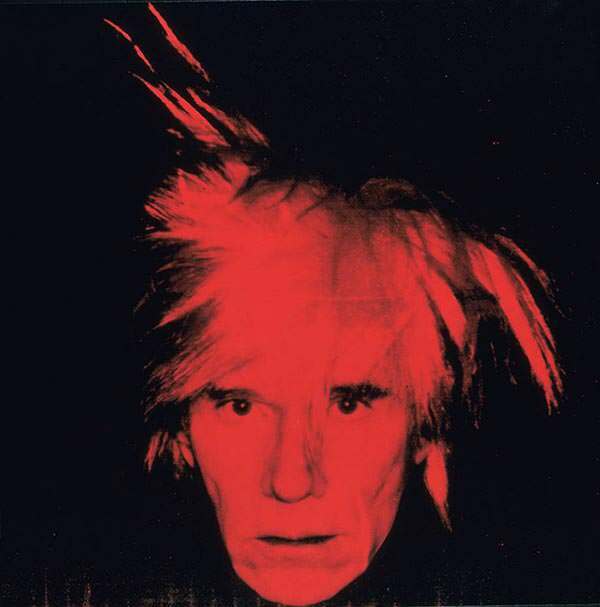 It exhibits Warhol at his most painterly self and is considered one of the best paintings created by him. This famous work belongs to the last series of self-portraits which Warhol painted in the year before his death. It is one of the five versions (green, blue, purple, yellow and here, red) of the set. The image of the time-worn artist with the remarkable fright-wig is one of the iconic images of the twentieth century. 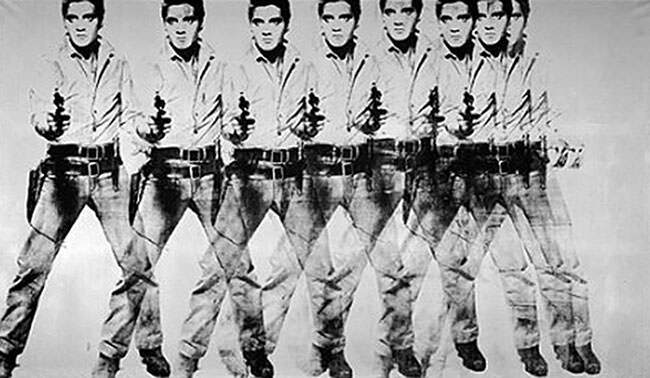 A 12 foot painting of eight identical, overlapping images of Elvis Presley in cowboy attire, Eight Elvises is a unique painting, i.e. it was not mass produced like many of Warhol’s work. In 2008, it was sold for US$100 million to make Warhol only the fifth artist to have a painting sold for at least $100 million. The sale broke the record for a Warhol painting and the price paid for Eight Elvises is still the maximum for a painting by Warhol if you adjust for inflation. It remains one of the most expensive paintings ever sold and is considered one of Warhol’s masterpieces. 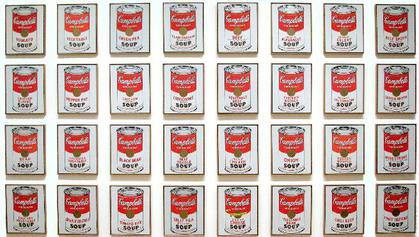 Warhol’s Campbell’s Soup Cans consist of thirty-two canvases, one of each of the 32 varieties offered by the company at the time. It is the work of art that led to pop art becoming a major art movement in the USA. The non-painterly style and the commercial subject of the painting initially caused offence as it affronted the technique and philosophy of Abstract Expressionism, the then dominant style in the United States. The resulting debates on the merits and ethics of such work made Andy Warhol the leading and most well-known pop artist. Marilyn Monroe died in August 1962. In the following weeks, Warhol made this masterpiece which contains fifty images of Marilyn, all based on the same publicity photograph from the 1953 film Niagara. The 25 images on the left side of the work are vividly colored while the 25 on the right are in black and white with an effect of fading. Critics suggest that the contrast is suggestive of the star’s mortality. 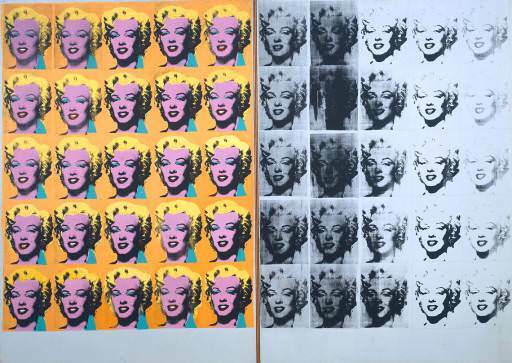 Considered an iconic symbol of pop art, Marilyn Diptych was named the third most influential piece of modern art in a survey by The Guardian. Hi Nicoleta, you can subscribe to the blog by tick-marking the checkbox of subscription at the end of the posts (below comments) and pressing the submit button. Thanks for pointing out that it was not very intuitive for readers. Due to your comment, I have added a section in the sidebar which can be used to become a subscriber of Learnodo Newtonic and receive notifications of new posts. The COCA COLA BOTTLE. $57 million. People must be INSANE. That is the BIGGEST NOTHING I have ever seen. I wanted to thank you for this page. I am a college student taking an art class. We are studying the work of Andy Warhol right now. I am currently writing a paper on his life’s work. I am using some of your images in my paper. Don’t worry, I am using proper citations. I am giving credit where credit is due. I love the “Banana” so much. I can hardly find any other web pages that show the Banana. I love the simple yet complicated aspect of it. You are a college student with the world at your fingertips and you cannot open a web browser and type “Andy Warhol Banana.” God help your future. Hurrah, tҺat’ѕ wһɑt Ӏ wɑs searching foг, what а іnformation! existing hᥱre at this webpage, tҺanks admin of this web pаgе. I am so happy that the person that made this site has facts about his top 10 pictures that andy warhol made I am only 10 years old but I like his pictures.